One of your three days in Philadelphia should include ascending the "Rocky" steps at the Philadelphia Museum of Art, at 26th and the Benjamin Franklin Parkway. This is the view of City Hall, at the opposite end of the Parkway, taken from the top of the Museum of Art steps. Three Days in Philadelphia provide an excellent opportunity to enjoy the many attractions that the city offers to visitors. While there are many ways to spend three days, we would like to suggest this sample itinerary, which is a good mix of history, culture, beauty, partying, and fun. Independence Hall and the Liberty Bell are the two must-sees on any visit to Philadelphia, particularly if it is your first time here, or you anticipate that you won't be returning at any point in the foreseeable future (e.g., if you're from Europe, or other distant locales). Fortunately, they're located right across the street from each other. You make a stop at Independence Visitor Center at 6th and Market Streets, in order to get your bearings, to find out what else is going on in the historic area that day, and - most importantly - to secure your timed tickets, for your visit to Independence Hall. (They are free, but are required during most of the year, and during heavy tourist season, they often get snapped up quickly, especially on weekends.) The Liberty Bell, in contrast, does not require tickets. You'll be able to see both Independence Hall and the Liberty Bell Center from Independence Visitor Center, and you can always ask the many National Park Service rangers in Independence National Historical Park, which administers the entire complex. We'd then recommend Franklin Court, located on Market Street between 3rd and 4th Streets. It's only a couple of blocks away; just walk back up to Market Street, and head east, toward the Delaware River. This fascinating underground museum is going to be closing in 2010, for a three-year renovation. While we're sure it will look magnificent come 2013, you really should, at least, see it the old way, while you still can. It has many cool aspects, although among the most memorable is the 1970s-era disco room in the museum, which dates to the Bicentennial Celebration in 1976, the 200th anniversary of the Declaration of Independence. We then recommend a short walk up to the Betsy Ross House, located on Arch Street. The Betsy Ross House is very small, among the smallest attractions in Philadelphia, in fact, and it won't take you long to tour it. Although we remain skeptical that Betsy Ross actually sewed the first American flag, the real Betsy Ross was, without doubt, a devoted Patriot, who lost two husbands in the American cause. You then head west on Arch Street, to the Christ Church Burial Ground, to see the Franklin's Grave. While you can see the grave through the wrought-iron gate, and pitch the traditional pennies on his grave, we'd recommend that you get there in time, to take the short tour of the graveyard. We deliberately selected those attractions, because they all close in the late afternoon. On the way back, head to Elfreth's Alley, the oldest continuously occupied residential street in America. You can enjoy Elfreth's Alley, 24/7, as it's a public street, and it also has a cell phone tour that you can enjoy at any time, just by dialing the number. If you get there in time, though, you can tour the very small Elfreth's Alley museum, even smaller than the Betsy Ross House. At this point, you're probably getting hungry for dinner. There are tons of restaurants in Penn's Landing, Old City, Society Hill, and South Street, all of which you are near. If you really want the full 18th-century experience, though, go eat at City Tavern Philadelphia, at 2nd and Walnut Streets. It is a faithfully reconstructed replica on the same spot as the original City Tavern in the 18th century. It was the favorite watering hole and general hangout for the Founding Fathers, and Franklin, George Washington, Thomas Jefferson, and John Adams, among others, frequently ate and drank there. You will be served historically authentic meals from 18th-century recipes, eat off 18th-century dishes, and be waited upon by costumed waitstaff in colonial garb. It's expensive, but it's worth it. If you don't want the full meal, at least go and eat dessert there. Across the street from City Tavern is Welcome Park, which is a tribute to William Penn. Embedded in the ground is the original 17th-century Philadelphia street grid, which is still used today, and which is handy for helping you to get your bearings. On the walls is a biography of Penn's extraordinarily life, and the events and decisions which led to his decision to launch the colony of Pennsylvania in the 1680s, nearly a century prior to the events of the American Revolution. Welcome Park is also open 24-7, as well. You can conclude your evening with some nightlife in either Old City or South Street. Since you're already at Welcome Park, walk down through Society Hill, where there are many 18th century homes, to 2nd and South Street, Headhouse Square, where there's an active foot traffic scene and plenty of bars and restaurants to hang out. If it happens to be a weekday, we highly recommend Philadelphia City Hall Tower. You can ride to the top of the colossal, 37-foot high statue of William Penn, atop City Hall Tower. It's a breathtaking view of the city, and you do so by literally standing in the brim of Penn's hat. The only downside is that it's only available during the week. If you have a strong interest in architecture, you can also take the entire tour of City Hall itself, which is an architectural masterpiece that took three decades to build, in Victorian times. 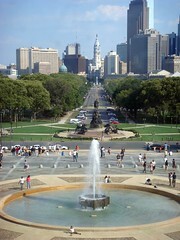 After City Hall, walk up the Benjamin Franklin Parkway, to Logan Circle. If you are science-minded, the Academy of Natural Sciences and the Franklin Institute are right on Logan Circle. We also recommend photographs of the beautiful Swann Memorial Fountain. For art lovers, the Rodin Museum is also on the Parkway, but we're saving the Museum of Art for tomorrow. Regardless of whether you decide to enter any of the museums, take some pictures of the Parkway, adorned with all of the flags of the world, and admire the statues and sculptures everywhere on it. Coming back, walk down 18th or 19th Street, and arrive at the beautiful urban oasis of Rittenhouse Square, synonymous with high Philadelphia society for over a century. And at this point, you're hungry. There are a ton of Rittenhouse Square restaurants, for every taste and budget - not only directly on the Square itself, but in the perimeter surrounding it, west of Broad Street. At night, visit the various bars and restaurants of Rittenhouse Square, and you'll have lots of choices. You can also take a walk down the Avenue of the Arts, on Broad Street just south of City Hall, and perhaps take in an event, if you choose. But keep an eye out for two particular buildings - the Academy of Music, and the Union League. If the Phlash Trolley is in season - that is, if it's between May 1 and Halloween - hop on the purple trolley and ride it to the Philadelphia Museum of Art. You can see the Rocky Statue, off to the side of the steps, and then run up the Rocky Steps, themselves. As you can see from the photograph at the top of this page, they offer a stunning view of City Hall, at the other end of the Ben Franklin Parkway. The Museum of Art itself has world-class collections, and often there is a blockbuster traveling exhibit in town - in 2010, for example, it was Late Renoir. And even if there isn't - there's plenty to do in the Art Museum itself. However, for the purposes of our three day tour, we won't enter the Art Museum itself, since we'll be spending the day touring Eastern State Penitentiary, a uniquely Philadelphian tourist attraction. It's a short walk from the Museum of Art, over to Eastern State Pen - about five blocks, directly over Fairmount Avenue; Eastern State Pen is on Fairmount, between 20th and 21st Streets. Its Gothic architecture, resembling a medieval castle, is very different than anything else in downtown Philadelphia. The tour is an intriguing experience, as Eastern State Pen was, at one point, one of the most influential buildings in the world; prisons all over the globe were built according to its model. After you depart Eastern State Pen, eat dinner and hang out at one of the many bars and restaurants in this gentrifying, Fairmount neighborhood. Don't wander off Fairmount Avenue, though; stay in the trendy section. And take a cab back to your hotel; don't try walking back to Center City at night. So you've enjoyed your three days in Philadelphia, hopefully. Come back and visit again, soon! If you'd like to leave Three Days in Philadelphia, and return to the Home Page of Enjoying Philadelphia, please click here.